The peak season for radishes is April thru July so I’m taking advantage of this great seasonal vegetable and putting them on the gas grill with some wood chunks to smoke up the flavors. I’ll first provide you my technique for bringing a wood flavor to these red beauties on a traditional gas grill, then I’ll use the finished product in a smoked radish and cannellini bean salad that is perfect as a side dish or for those vegetarians, add some non-animal protein to be a main dish favorite. Let’s get started! 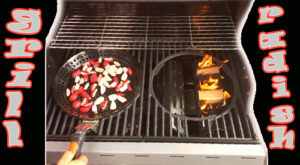 Using an LP or natural gas grill makes this such an easy yet highly flavorful way to add wood-fired flavor to radishes. First, I heat my grill using all burners (I have 4 total on my unit). I add 2 double filet wood chunks from SmokinLicious® to one of the heat tents of the grill. Heat tents diffuse the heat evenly throughout the grill area. These also go by names such as flame tamers, diffusers, flavor bars. Once the grill is to temperature, I will leave the burner with the wood chunks on medium and add my grill pan insert to the grill. A vegetable pan ensures the radish pieces won’t fall thru traditional grill grates and allow for more even cooking and smoke flavor. When purchasing radishes look for plump, firm and smooth ones without any cracks or blemishes. If purchasing with the greens intact, know they should be used within 2 days. Those purchased in plastic bags remain fresh for up to a week. My preparation of the radishes is very simple. I remove the green leaves and stems – remember, these are highly nutritional as well so they can be added to a mix leaf salad or in a smoothie – and cut away the stem head and pointed tip. Then wash the radishes well in a colander making sure all signs of dirt are removed since these are a root vegetable. Pat dry and then cut into thin wedges as this sizing will be needed for my smoked radish and cannellini bean salad recipe. Now, off to the grill which should be hot and ready to go. With the radishes cut into thin wedges and placed on a vegetable tray, mine is the vegetable tray insert for the Stōk® grill system, I’m ready to place the insert on the grill. First, I keep the burner that the wood chunk pieces are on lit as well as the burner next to that one. The other two burners are turned off as I will use the accumulated heat to cook the radishes in an indirect method. Closing the grill hood allows the radishes to tenderize and infuse with wood smoke vapor. I am looking for these to be tender but still have a bit of bite to them. In a blender, combine the anchovies, oil, capers, and 1 cup of parsley and blend until a coarse puree forms. Transfer this blended mixture to a large bowl; mix in ¼ cup vinegar, and season with salt and fresh ground pepper. You can add more vinegar if the mixture appears dry but usually the recommended amount is perfect. Our puree mixture will be the dressing for our salad. Once the puree mixture is added to a bowl it’s time to bring in all the other aromatics. First, add the smoked radish wedges followed by the scallions, beans, olives and remaining 1-1/2 cups of parsley and toss well to combine. Despite having both anchovies and capers in the mix, this is not a salty tasting bean salad so those with sodium concerns can relax and enjoy. We’ve taken our previously grilled and smoked radish wedges flavored with SmokinLicious® double filet ash wood chunks, and produced a rich, flavorful bean salad packed with the flavors of fresh parsley, olives, and layered in flavors from capers and anchovy. This salad can be made 4 hours ahead, covered, and chilled until ready to serve. It is the perfect compliment to fish, poultry, and steak. For a vegetarian take, add hard-boiled egg or tofu. We’ve even added seasonal strawberry and grapes, as fruits add a nice sweet level that works very well. Take advantage of seasonal radish’s high nutritional value, and put your take on this great recipe. Did we stimulate your imagination with this RADISH SALAD WITH A WOOD-FIRED FLARE recipe? Leave a comment and don’t forgot to follow us and subscribe so you don’t miss anything. We always welcome suggestions on future recipes you’re looking for.